Just two more weeks until the monster California Extreme show and tournament! If you’ve never been, you really owe it to yourself. 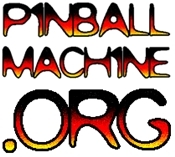 There will be over 500 pinball and classic video games, seminars, a massive tournament and tons of fan activities. If you’re a little stretched for cash, consider volunteering to earn your entry! Details here. Like last year, I’ll be running some just-for-fun side tournaments, such as split-flipper and one-handed. I’ll announce these events over the PA system at the show once I know the schedule of the other tournaments, but you can assume around 1 – 2 PM, and again around 4 – 5 PM.